In the US, some states have begun to address rural high-speed intersection crashes by physically restricting minor-road crossing movements (left and through turns) to simplify driver decision-making in terms of gap acceptance (the extent to which drivers will be able to utilize a gap in traffic of a particular size or duration). These treatments are referred to in Minnesota as reduced conflict intersections (RCIs). 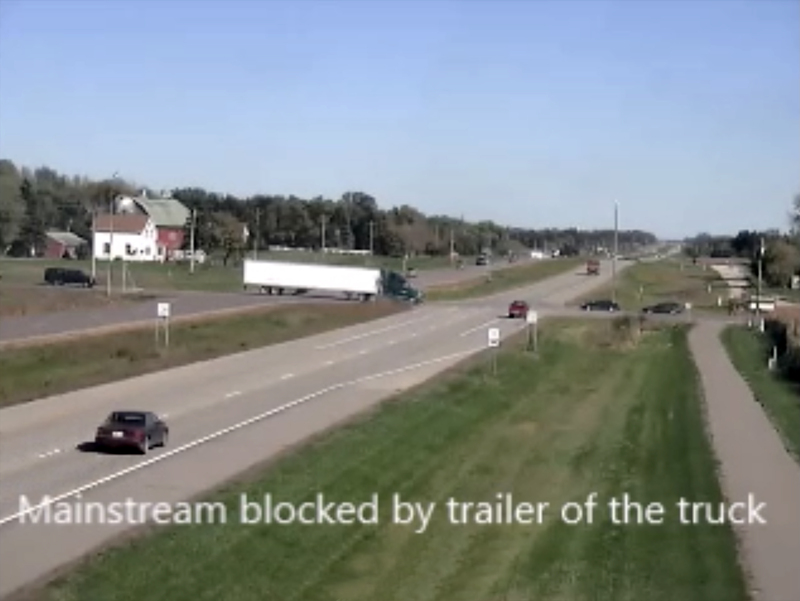 Within Minnesota’s rural corridors, introduction of RCI design has been successful in preventing severe crashes; however, the unusual design has been met with some apprehension from operators of agricultural equipment and large trucks. This, in combination with a resistance to the unfamiliar, has created a desire for more information regarding RCI configuration safety impacts for these types of vehicles. Even though RCIs eliminate right-angle crashes, which are the most severe crossing conflicts at rural high-speed intersections, concerns have been raised that, as large trucks are required to make U-turn maneuvers, they occupy the travel lanes for longer than would be required for a left-turn or through maneuver from the minor road, and, consequently, are exposed to on-coming high-speed vehicles for longer. In response to these concerns, two different studies were conducted to evaluate large truck behavior at reduced conflict intersections. Both studies were sponsored by the Minnesota Department of Transportation Office of Traffic, Safety, and Technology. Crash and traffic data were requested for known known RCI locations in six states: Maryland, Minnesota, Mississippi, Missouri, North Carolina, and Wisconsin. Crash data from four of those states (Maryland, Minnesota, Missouri, and Wisconsin) had the necessary data elements to conduct a simplistic before and after analysis. Crash data included characteristics such as location, type of vehicle, crash type, crash severity, and sequence of events. Crash data were requested for 300 ft around each intersection before installation of the RCI and from the intersection to 300 ft beyond the new U-turns. Because data were limited, a simple before and after analysis was conducted for total crashes and truck crashes to evaluate the impact of installation of the RCIs. The majority of sites (13 of 15) experienced a decrease in total crashes per year with only one site experiencing an increase in crashes after installation of the RCI. Similarly, the majority of sites experienced a decrease in truck crashes (9 of the 15) with 2 sites having no change and 4 sites having a small increase. One of the main goals of the research was to determine whether the frequency of truck crashes may have increased due to the added exposure of trucks in the oncoming lanes as they complete the U-turn. Truck crash patterns were evaluated for the periods before and after installation of the RCIs. The intent was to identify whether crashes were occurring that may have been a result of increased exposure of trucks in the on-coming travel lane. Crash diagrams were examined to determine whether the crash may have been due to a conflict between the turning truck and another vehicle due to the intersection. Based on the limited data available, the evaluation suggested that installation of the RCI appears to have shifted crash patterns from the more severe right-angle crash to less severe rear-end and sideswipe crashes. Evaluation of truck crash patterns before and after installation of RCIs did not suggest increases in the type of crashes that would have appeared to result from increased truck exposure in the on-coming lanes as trucks completed a U-turn. 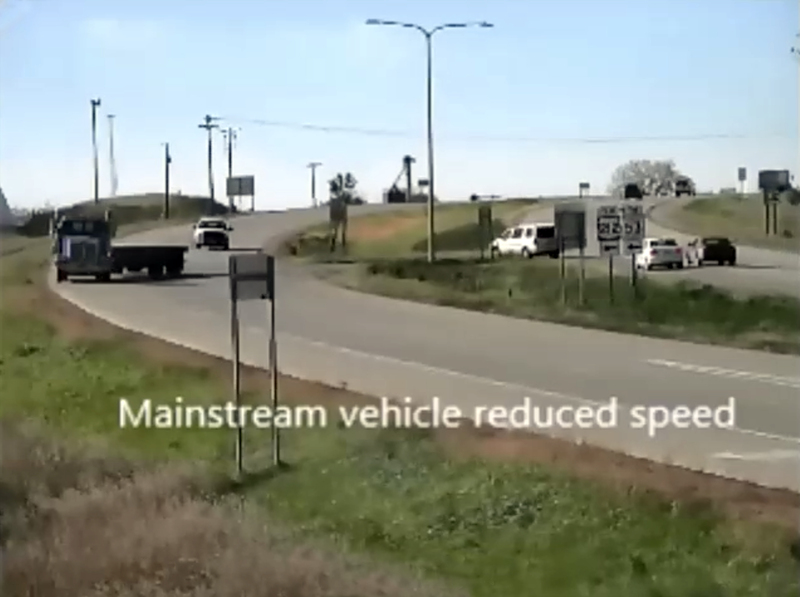 This study collected and evaluated large vehicle operational behavior at a set of RCIs and at similar standard control intersections in Minnesota. 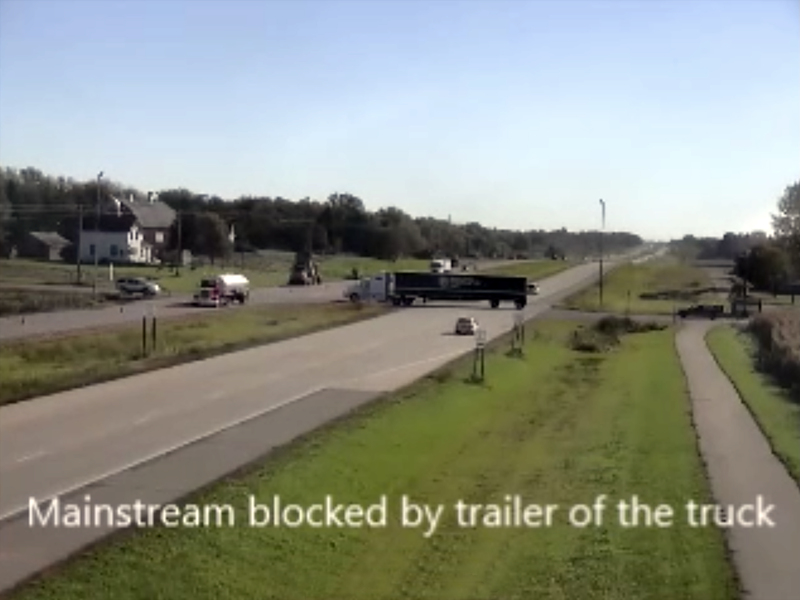 The researchers collected data in 2015 using a portable video trailer array and metrics on truck turning movements at three RCI intersections in Minnesota and three similar non-RCI intersections, which were proximate to the RCI intersections. The researchers compared travel time, conflicts, and other metrics for this study. The research team reduced video data and compared metrics between RCI and control intersections as noted below. One of the main concerns expressed about RCIs is that large trucks/vehicles would take a significant amount of time to enter the traffic stream during U-turn maneuvers. This may result in large trucks/vehicles occupying the oncoming travel lanes for an increased period of time, which could lead to conflicts. The researchers evaluated exposure time (when a vehicle occupies a non-travel lane while waiting for a gap or to complete a maneuver) for both RCI and control intersections. In all situations, large trucks were exposed for significantly less time during the U-turn than during a left or through maneuver at a control intersection. The researchers also compared evasive maneuvers (situations where an on-coming vehicle has to brake, slow, or change lanes to avoid the large vehicle crossing the intersection). Evasive maneuvers during U-turn maneuvers at RCIs were of the most concern. The average number of evasive maneuvers created by large vehicles at the RCI U-turn locations was half as many as the average at the control intersections. This study found no evidence that validated concerns expressed about large vehicle operation at RCIs. Exposure time was not increased at the U-turn locations and evasive maneuvers were lower than at control locations.